Do you remember the days when skincare was simple? A quick cleanse, tone and moisturise and you were sorted. Things are so much more complicated these days with endless products on offer and some people having skincare regimes that involve slapping on 16 of the things. (For what it’s worth I really don’t think that you need an 8 step let alone 16 step regime. Not only will it break the bank but it will totally overload your skin). Anyway, if there’s one step that I really do think is worth investing in, it’s the application of a serum under your moisturiser both AM and PM. The right serum can pack a serious punch and make a real difference to your skin. I tend to spend money on my serum and not worry quite as much about my moisturiser and I recommend that you do the same. Bare Minerals have launched some great products over the years. 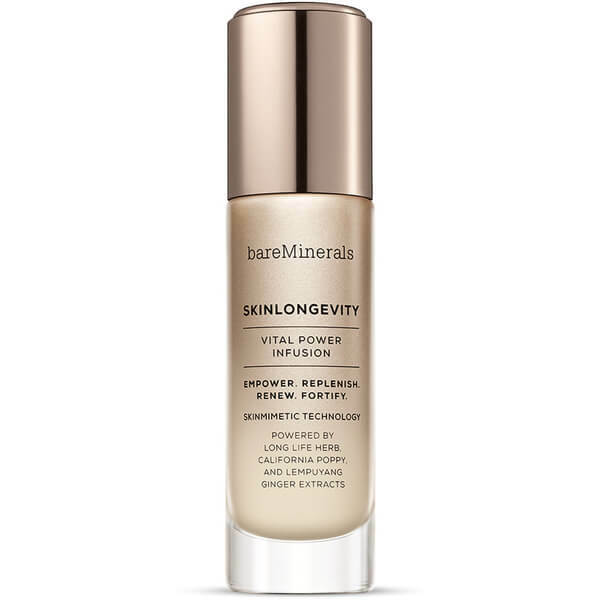 I love their lipsticks, use their Tinted Gel Moisturiser on a daily basis and have recently been very excited to discover their Skin Longevity Vital Power Serum. It goes on smoothly and dries really quickly without leaving a sticky residue. I’ve been using it in the morning under Embryollise and then applying my makeup which has been going and staying on really beautifully. The serum itself has definitely improved my skin. It is clearer and healthier looking than it has been recently and that’s no mean feat seeing as I get up at 2:20 am every day to do my radio show and am getting minimal sleep anyway because my two little ones have very noisy Winter coughs. Look Fantastic are selling a 30ml bottle for £26.80 rather than £34 here. Buy it. It’s brilliant.